Happy Friday! I spent most of last night finishing up some baking that I was doing for our local fireman's bazaar bake sale and I even baked an extra coffee cake for my husband. 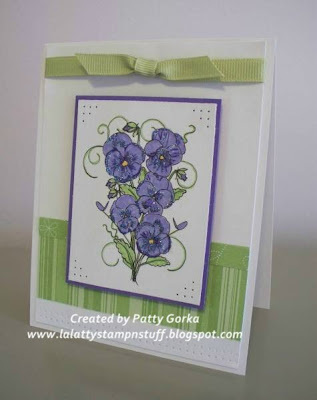 My card for today uses this lovely digi image from FireCracker Designs by Pamela. This is such a pretty image and really easy to color. I simply printed out the digi image off of my computer and then I heat set it using my heat gun. Next, I colored the pansies and leaves using my SU markers. I bet these pansies would look great in all sorts of colors! Once I had my image colored I simply assembled my card. I added two rows of paper piercing just along the bottom of my card. I also added a little bit of paper piercing in each corner of my main image panel. My certainly celery dp is from SU and I just folded over the top 1/2" of the paper. I also added a little bit of glitter along some of the flowers and my ribbon is from Offray. This is lovely. What a great clean, crisp design. Beautiful! Gorgeous image and great coloring. I love Certainly Celery - I think it's my favorite SU green. Gorgeous card! I really like that image.And your coloring is so pretty. Beautiful! I love the flowers! Awesome layout, too. Beautiful image and love all the details you thought of using! This is gorgeous, love those purple flowers!